With the running group starting back up this weekend, I thought I would post this inspiring article that I’ve had in my archives. Its from back in the days when I was soley a running coach. It was published in the Herald Sun and I often get it out as a running motivator. One of the best ways to lose weight and get fit is by running, but when you mention this to some people you hear the old whine, “ I have never been able to run”. Pounding the pavement kilometre after kilometre, taking in the sights of a new city while on holiday, pushing yourself to the limit…….runners love it, but non-runners just don’t get the appeal. Their reason for “hating running” is simple (it’s the same reason I hate snow skiing): they can’t do it. But if they could do it they’d love it because we were all born to run-it’s in our DNA. Most non-runners tell you they get out of breath quickly, then struggle to recover. That’s not a sign of being a non-runner. It’s a sign of being unfit. To some degree running is a skill we all have. You don’t need to be co-ordinated. If you can walk you can run. And that’s part of the problem. If you are not a runner you need to start with baby steps. Because most people can do it they just decide to go for a run, then run. Sounds like a good plan, right? Wrong. The result of this seemingly innocuous action will be twofold: you will run out of puff and give up; and if you do persevere you will end up injured. The best way to begin is with a walk to run program, building up to run over time. This way you will be more inclined to stick with it. Soon running will sink its claws into you and you will become one of those people who look at non-runners as though they are missing out on a secret. This time you will be the one in the know. I will be taking on new runners and utilising this walk to run program for them. We will start off on flat terrain and be working up to running 3km without stopping over the coming weeks. There will be a middle distance group also of 4-6kms and then the more experienced runners will cover around 10kms. We will be building towards the fun run goal of Run Ballarat and King of the Mountain which are both in October. There are 6km and 11km distances in those runs. We will meet every Saturday morning at DeSoza Park at 8am for a gold coin. The runs will be mapped out and you can slot your self into a group you think your suited to. I have an admission to make- We had fish and chips for tea last night! I can hear you all gasping. But before you think we’re on some sort of bender, let me reassure you that it was the healthy version of “fish and chips”. 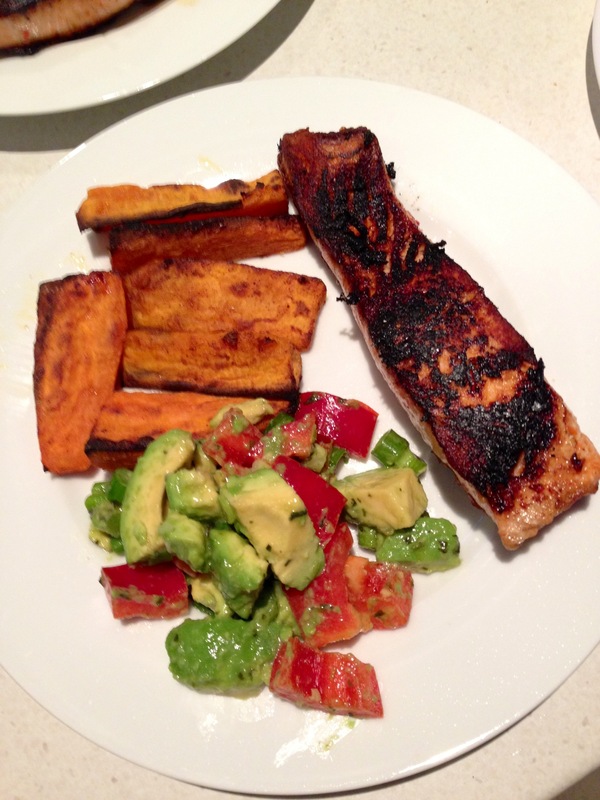 We actually had salmon with a side of sweet potato wedges. This was an idea I saw on the body and soul website but altered it to our liking. Let me tell you IT WAS DIVINE! It contains a good dose of healthy fats. They are in the avocado, salmon and olive oil. Place avocado, capsicum, spring onion, coriander, lime juice and 1 tbs of the oil in a bowl. Toss gently to combine. Preheat a pan on medium-high. Place salmon on a plate and drizzle remaining oil over to coat, leaving salmon skin-side down. Combine paprika and chilli flakes in a small bowl. Sprinkle over salmon. Cook salmon skin-side down, for 2 minutes. Turn and cook for a further 1-2 minutes for medium or until cooked to your liking. And just a quick thanks to all those who came along to SportsBiz on Tuesday night and Wednesday. This is a copy of the email from Matt showing his appreciation of supporting local small business. Cheers, guys!! Just a quick one thanking you once again for the shopping night on Tuesday night. We had a couple of more people come in on Wednesday as well. I think the Asics Noosa Tri shoes have been the big winner. Can you please pass on my appreciation to the people that turned up over the couple of days. It is very much appreciated and I look forward to working with you and doing some more shopping nights in the future.